Did you know that how you name your published assets can impact how they show up in search results on TurboSquid? As we roll out our new category system, Feature Graph, the inclusion of file extensions such as “.max”, “.zip”, and the like in your asset titles may limit how customers find your products. You are among a small group that can see new categories on Product Pages (also referred to as Full Preview pages). When reviewing your own assets, please check assets’ new categories for accuracy. If you do encounter an error, please use the link provided on Full Preview page or email the Product ID and changes you recommend directly tobreadcrumbs@turbosquid.com. Stay tuned to our social channels every Tuesday as we share #TurboTips! This is an ongoing series to provide you with quick tips to make the most of your 3D modeling programs, as well as best practices for preparing your models for real world customers around the world. Within this very candid post, Matt touches on the choices that have been made, as well as the amount of thought, engagement, and respect between all of those involved, as we move the industry forward. Read the complete post by TurboSquid CEO Matt Wisdom for clarity on what he sees in the near future for the 3D industry. Over the holidays, we implemented a pop-up to warn potential customers that the product the were looking at was not an actual Christmas gift, but a 3D model. Perhaps we can credit Santa’s magical powers for the results: our Thought It Was Real (TIWR) refunds in 2013 dropped by a staggering 88%, compared to the TIWR refunds in 2012. This was the best gift our support staff could have asked for. TIWR calls and chats dropped by 67% from last year, as well. Of course, that also means that the funny holiday horror stories from our support team dropped by 67% as well, but that’s ok with us! The artists over at Tornado Studio are going for the gold with this month’s new featured image! This downhill skier is definitely Sochi-ready. 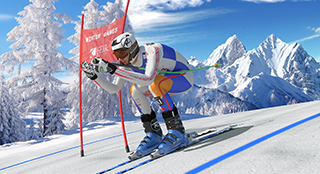 Check out our Featured Artist Interview, where we talked to Tornado Studio’s founder and CEO about his history with 3D modeling and his favorite Winter Olympic events. Want to see your CheckMate Pro Certified Model featured on the TurboSquid home page? Anything is possible if you just submit your model!